My day job frequently takes me to Rockefeller Center, which apart from Saki Bar Hagi and Iroha, is a pretty bleak area for good, reasonably priced eats. Thankfully the recently opened Yama Ramen is looking to change that. This second floor walk up is decorated in a vaguely rustic Japanese pub style, like it aspires to be an izakaya Toshiro Mifune’s character in the Seven Samurai would hang out at. Yama Ramen’s menu includes ramen, sushi, donburi, chirashi and tempura. The Dumplings: Yama Ramen serves house made Pork Gyoza and Shrimp Shumai and Takoyaki. It also has a selection of buns which are stuffed white, fluffy Chinese style breads, so not dumpling style buns but still super good. 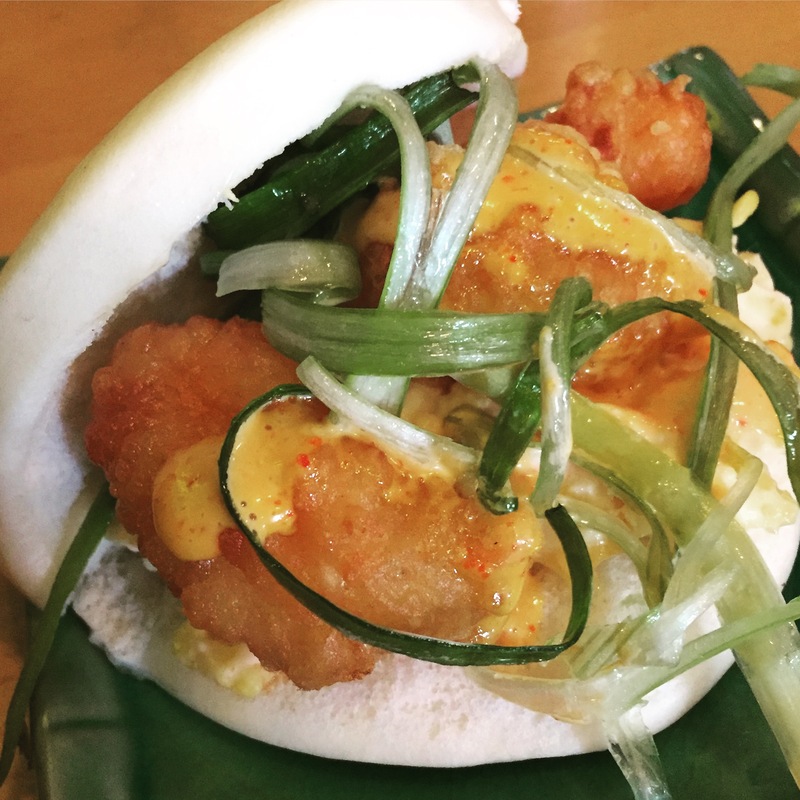 The buns come stuffed with Pork Belly, Shrimp, Chicken Katsu, Beef Yakiniku or Portobello Mushroom and are dressed with seasoned mayonnaise and slivered scallions. 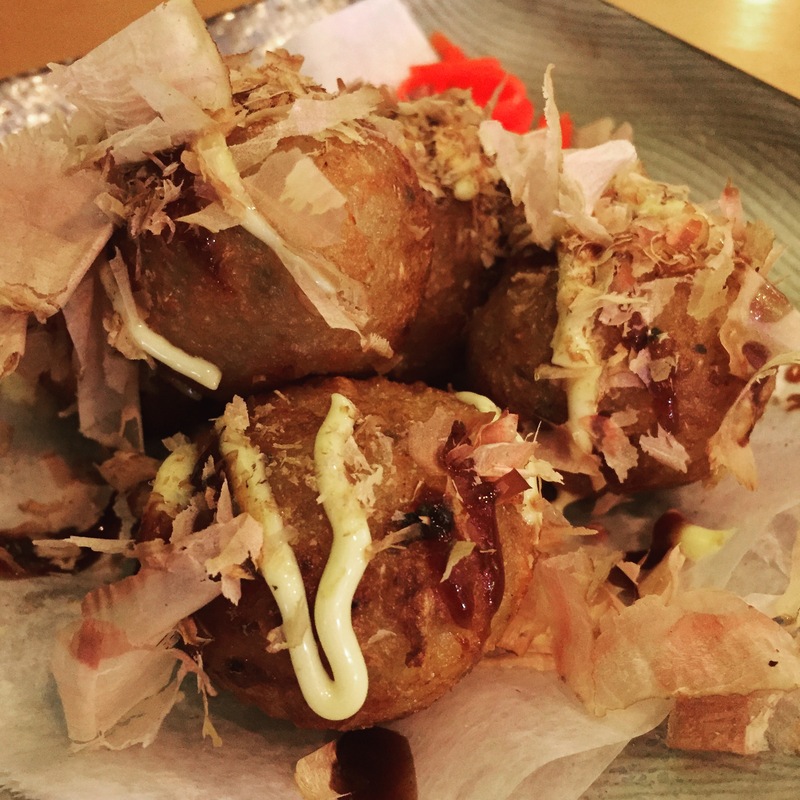 The Takoyaki – The takoyaki at Yama Ramen, come five to an order and are fully dressed in drizzles of mayonnaise and Worcestershire based brown sauce and a blanket of bonito flakes. The takoyaki were perfectly cooked so that the outside was crispy and the dough inside was creamy without being under cooked and the octopus pieces had a crunchy bite without being rubbery. These takoyaki were the perfect post-meeting snack, up there with those from Otafuku. The Location: Yama Ramen is on 48th street between 5th and 6th avenues, just south of Rockefeller Center above a Lenwich Bagel shop. Look for the menu board standing on the sidewalk, mid-block on the south side of the block. This entry was posted in Japanese, New York City, Takoyaki. Bookmark the permalink.